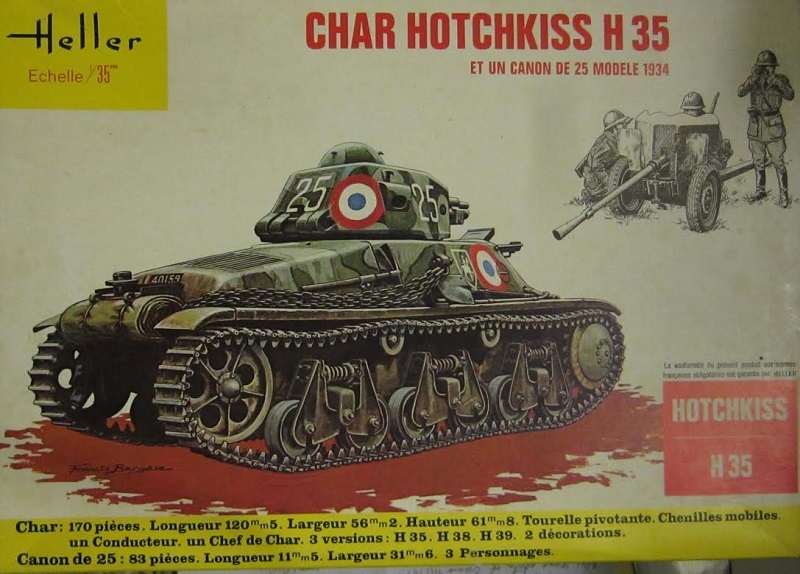 The Hotchkiss H35 or Char léger modèle 1935 H was a French light tank developed prior to World War II. Despite having been designed from 1933 as a rather slow but well-armoured light infantry support tank, the type was initially rejected by the French Infantry because it proved difficult to steer while driving cross-country, and was instead adopted in 1936 by the French Cavalry. ​From 1938 an improved version was produced with a stronger engine, the Char léger modèle 1935 H modifié 39, which from 1940 was also fitted with a longer, more powerful 37 mm gun. It was intended to make this improved variant the standard light tank, with at least four thousand produced to equip new armoured divisions of both the Cavalry and the Infantry, but due to the defeat of France in June 1940 total production of both subtypes was limited to about 1200 vehicles. For the remainder of the war Germany and its allies used captured Hotchkiss tanks in several modifications. Heller was a French model company based in Paris, France. They went out of business in 1961. This kit came in a shrink-wrapped tray and lid type box, with a very sturdy tray. The box art shows a H35 posed against an all-white background, similar to how Tamiya does all their box arts. The tank is in a base of medium-grey with green splotches outlined in black. It has a French roundel on the turret sides and the hull sides. There is a shield with a horseman on it on the hull sides with a white 25 on the back and sides of the turret. One corner of the box art has a black and white illustration of the Canon de 25 Modele 1934 and it's 3 man crew. 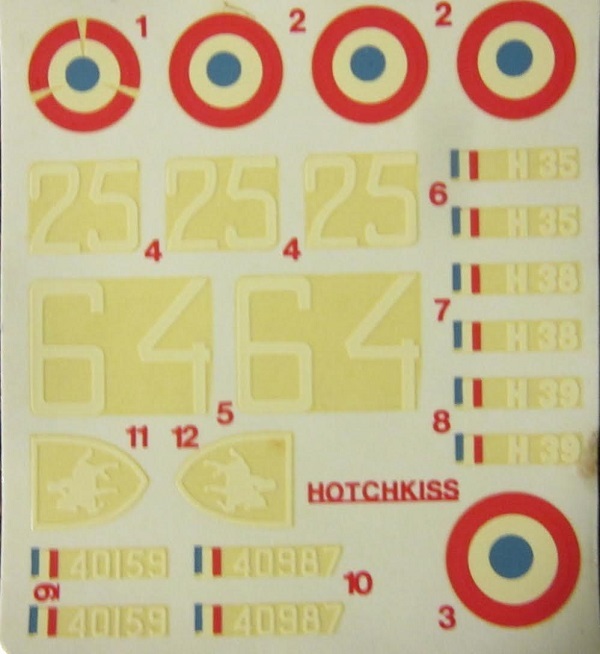 One side panel has 2 color box arts of other AFV kits Heller marketed: a French AMX 13 75 and a AMX 13 DCA. No kit numbers are given for these 2 kits. In English and German, marked with color illustrations of the Flags of Britain and Germany, features are give as: The model has 170 parts. 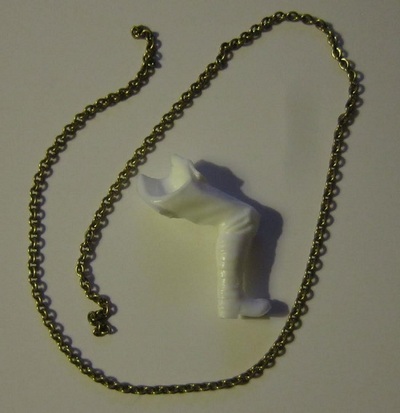 It makes up to be 120.5 mm long, 56.2 mm wide and 61.8 mm high. It has a pivoting turret and moving tracks. 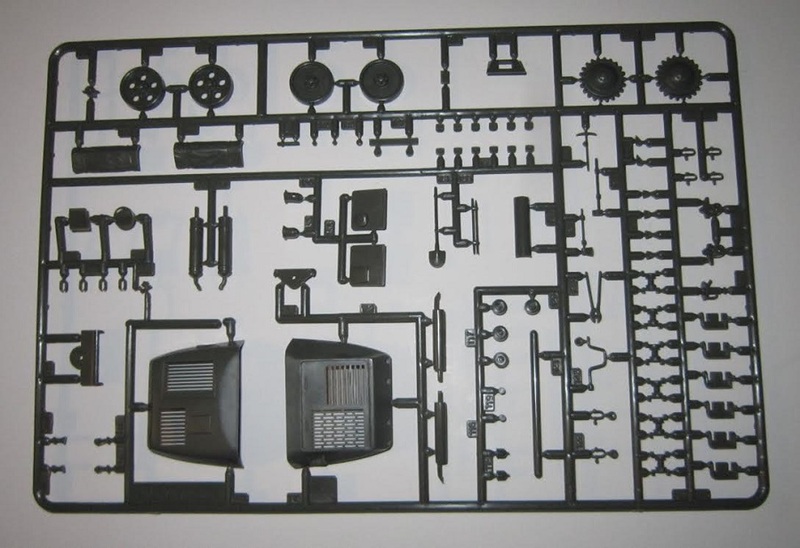 The kit contains one drive and one tank commander figure. 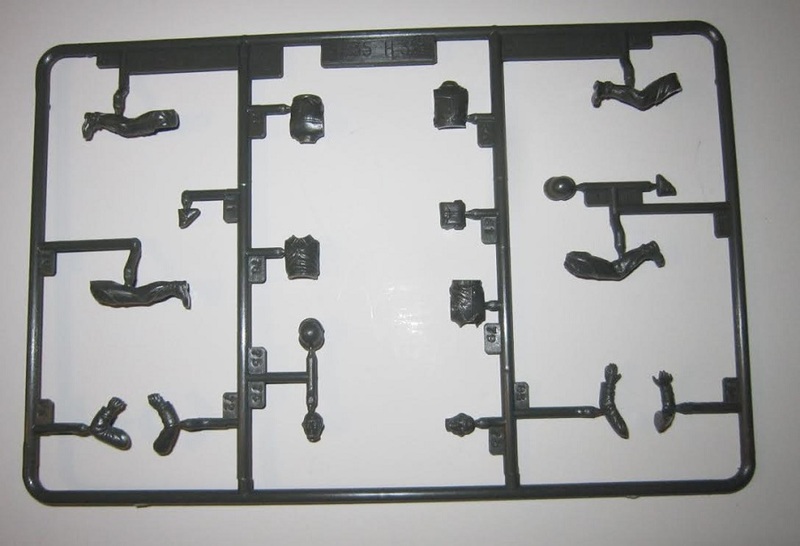 The other side panel shows 3 box arts: the AMX 13 75 and the AMX 13 DCA again and the AMX 13 755. Again no kit numbers are shown for these. This kit holds 4 dark-green trees, 4 chalk-white trees, black vinyl treads and tow cable, a metal tow chain in a sealed cello bag. 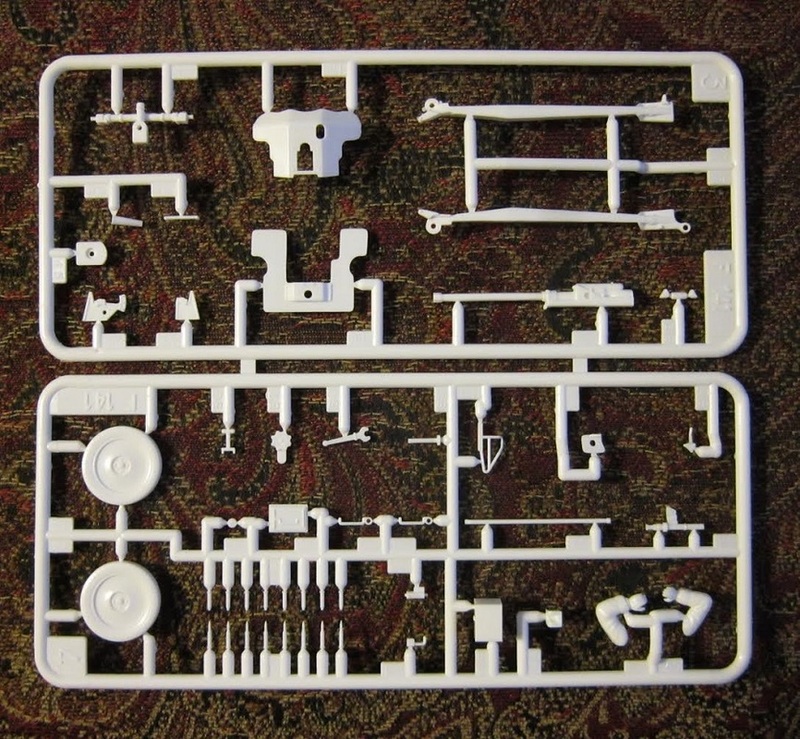 The decal sheet and instructions complete the kit's contents. The decal sheet has a tissue to protect it's face, but it is floating around loose and not protecting anything. 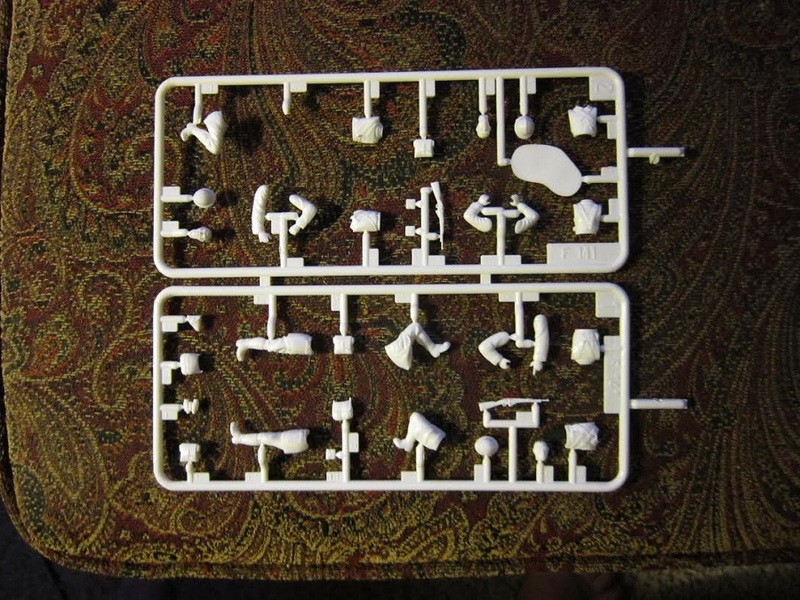 The sprues are numbered and NOT alphabetized. Tree number 1 and 2 are co-joined. 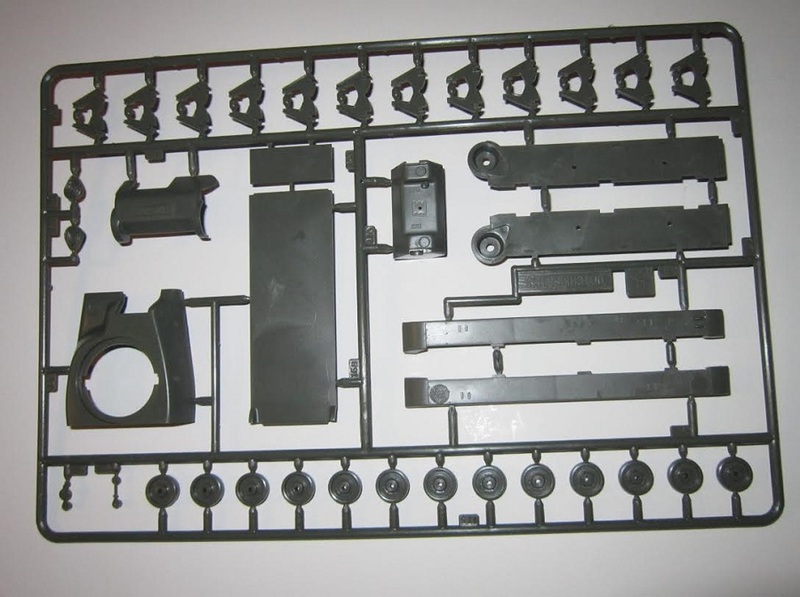 ​The decal sheet, metal chain, tracks and instructions complete the kit's contents. There are no clear parts or any internal details. ​The instructions consist of an un-bound booklet of 12 pages in 8 1/2" x 12 1/2" page format and 2 single sheets that are 19" x 12 1/2" in size and printed on both sides. Page 1 of the instructions has a black and white illustration of the H35 and the Canon and it's crew posed in a city square. The H35 is a front view and shows a license number of a French tri-color and 40159 on it's nose. Page 2 is the history of the tank in French. Page 3 is a listing of the names of each part in French. Page 4 through 11 give a grand total of 13 assembly steps. Assembly step M is for the cannon and crew. Page 12 has the marking and painting instructions and a customer service coupon. Text, again, is all in French. There is a large sheet in the kit that is a English translation of the instructions and a second large sheet that translates to German. ​This is a nice older kit externally. Recommended. I bought my kit back in the 70's at my local hobby shop.